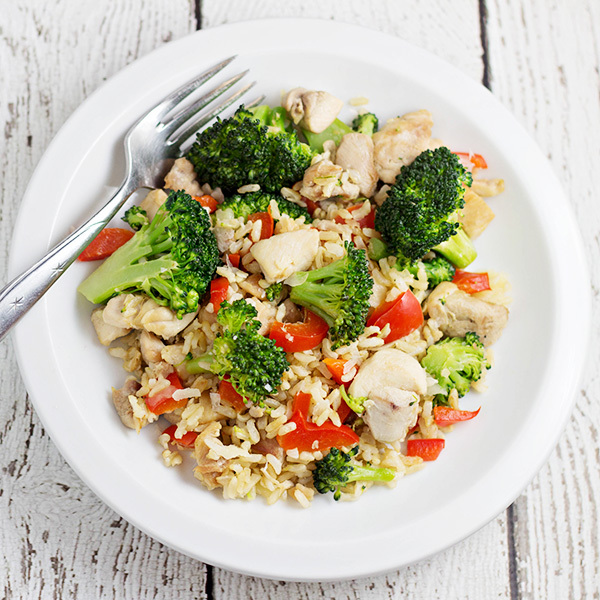 Need a fast dinner that’s healthy too? 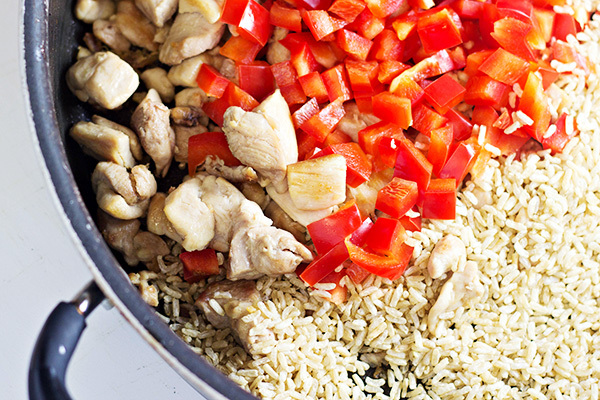 You can have this 20-Minute Chicken and Rice Skillet Dinner recipe ready in no time! This is a sponsored post on behalf of Cooking Light and Real Simple. This post contains affiliate links. Lately, I’ve been pretty horrible at menu planning. I really don’t know why, because I always feel better and more organized when I have a weekly menu plan, but I’ve been hit and miss with them for a while now. The worst part of my lack of menu planning is that we’ve been going through the drive-thru and getting take-out WAY too much. I’m okay with it happening occasionally, but weekly? That doesn’t make me happy. Last week, it was getting late in the day and I had to pick up a few things at Target. And I had no dinner planned. As soon as I got in the store, I grabbed two of my favorite magazines — both of which have easy dinner ideas. 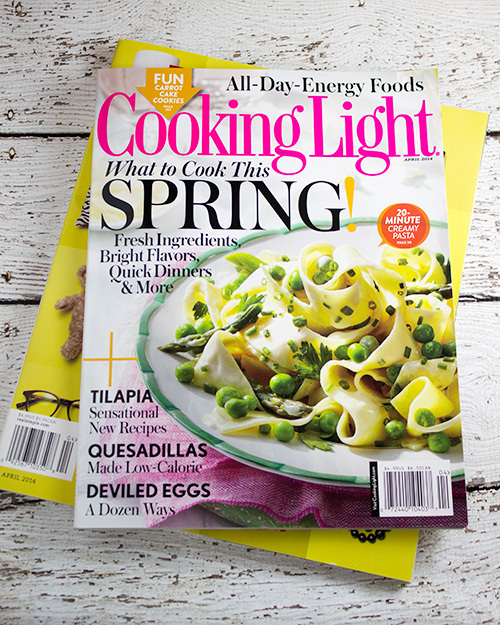 One was Cooking Light magazine…. 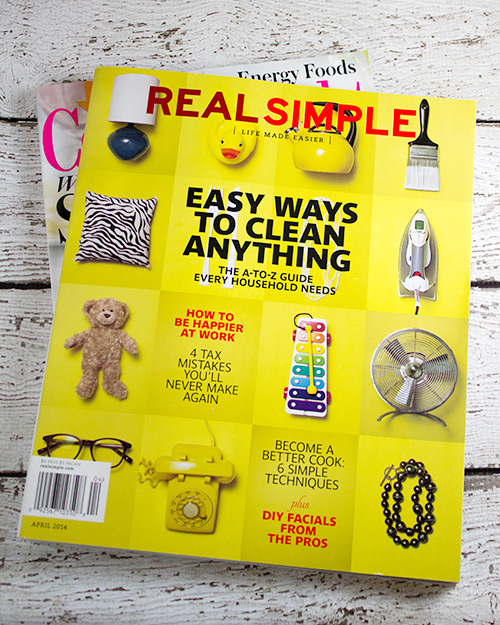 And the other was Real Simple magazine…. As I did my shopping, I started looking through the magazines for an easy and healthy dinner idea. My goal was to find something that could be made in 30 minutes or less, plus something that I could buy all the ingredients for our Target (which is a non-Super Target because we don’t have Super Target’s in Nevada). With just a few glances through the magazine, I was able to find a recipe that looked simple, sounded delicious, was healthy, and was something that I could completely buy at Target. 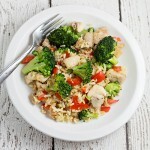 I decided on 20-minute Chicken and Rice Skillet dinner recipe, which I found on page 34 of Cooking Light’s April Issue. 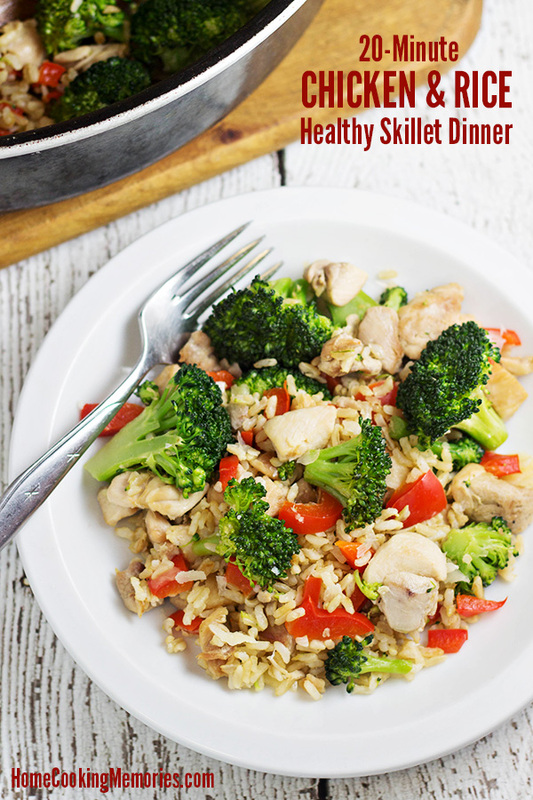 It’s a VERY easy recipe, healthy, AND it’s all made in one skillet so there is less to wash. Simply cook bite-sized chicken thigh pieces and then add chopped red bell pepper and instant rice. You’ll also add broccoli florets and when the recipe is complete, you top with shaved Parmesan cheese. My kids loved it and even said — while they were eating it — that we should have it again. If they request something for dinner again, before that dinner is even over, then you know it must have been a hit! And this turned out to be a much healthier meal than what I would have picked up in the drive thru. Heat a large skillet over medium-high heat. Add oil to pan, swirl to coat. Add chicken; cook 5 minutes or until browned, stirring occasionally. Add bell pepper, rice, water, pepper and salt. Stir together. 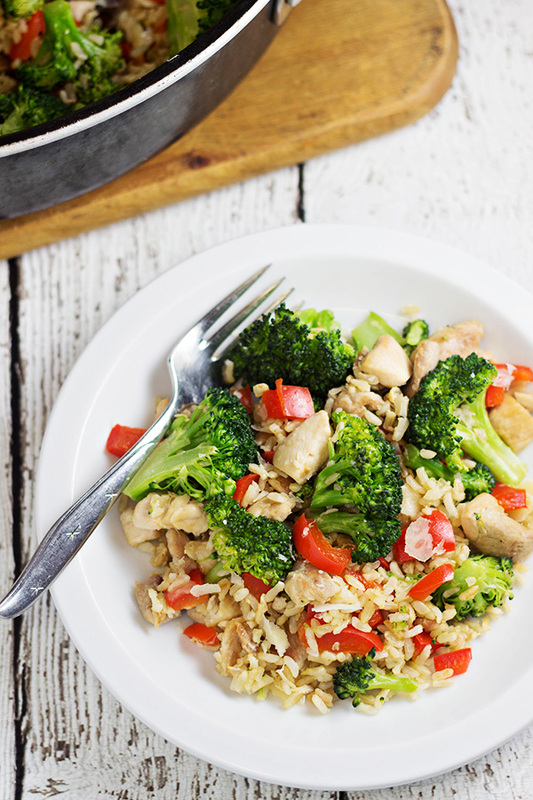 Add broccoli to top of chicken and rice without stirring; cover and allow to sit for about 2 minutes. Stir broccoli into chicken/rice mixture. 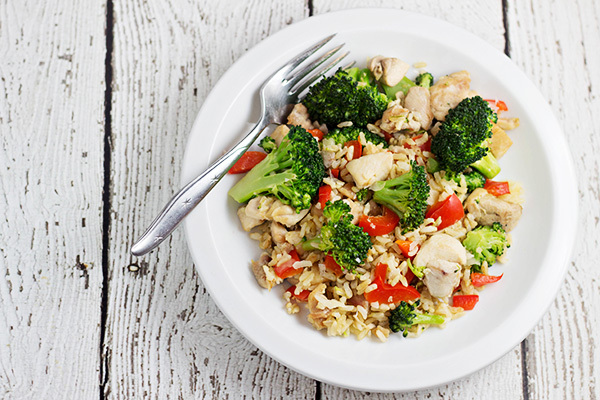 Continue to cook until rice is fully cooked and broccoli is tender-crisp. Remove from heat, Sprinkle with Parmesan cheese and serve. I made this and I thought it was easy to prepare and very good. 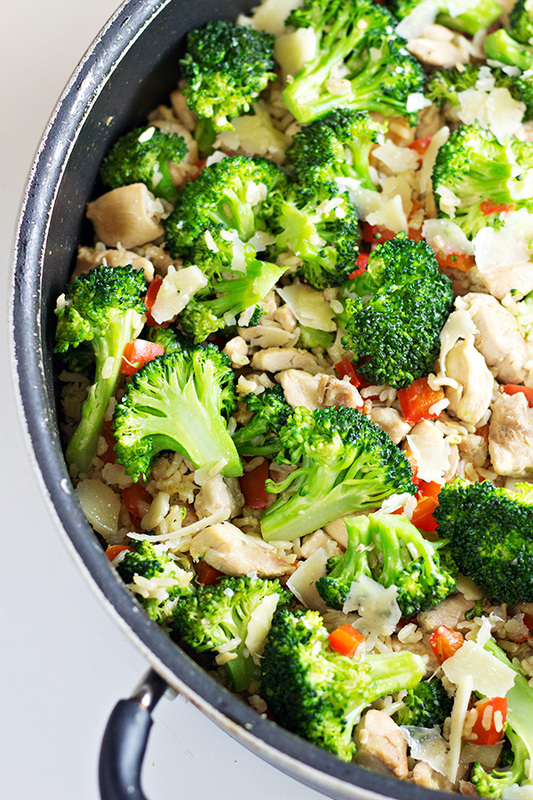 Your Chicken Rice Parmesan Skillet looks delicious! Hope you are having a great day and thanks so much for sharing with Full Plate Thursday. I love that you used chicken thighs instead of chicken breasts. This looks delicious! Thanks for sharing and happy Fiesta Friday! My kind of recipe! This post will be Featured for Merry Monday this week and shared on my FB page. So glad you party with us! Pinned it. Looks great but I have a big family and want to make sure I make enough. This recipe serves 4 (about 1 1/4 cups per serving). Yum! I’d say you did good! 🙂 I’d be happy to eat that anytime~ Thanks for bringing this by Throwback Thursday and Happy New Year~ I’ll be pinning this to our Throwback Thursday board. This looks like everything I’ve been craving! I dropped my (almost) adily fried rice due to gluten, and can’t find something to fill that void! Oooohhhh I’m always looking for fast and delicious meals. This one looks like it will be making an appearance on my table soon! Thank you, Jennifer! I was so hoping it would turn out well and am really happy that it did. That looks so light and healthful and good for you. No wonder you chose that one. I need to pick up that issue stat! I love a one pot meal. This looks so colorful and delish! This looks fabulous! I can’t get enough broccoli right now. Can’t wait to try this. Yum! This looks so delicious! I’d love to have this for dinner tonight! Ooh yummy, this looks like a tasty and easy idea for a quick dinner. I love all of the ingredients, I bet they taste fabulous together! 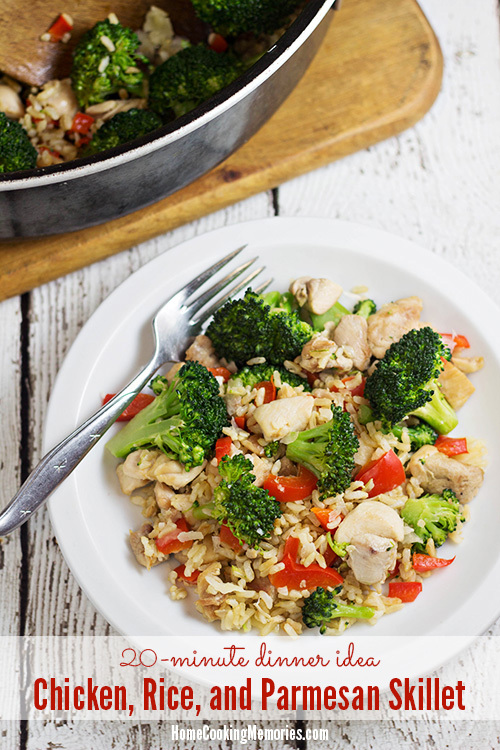 that looks like a great recipe – love chicken and broccoli especially together! This is beautiful!! I love that it’s light and want to start lightening everything up for spring. I definitely want to try this!! That looks delish, thanks for the idea! Fast isn’t always the healthiest choice, nice to see better options! I need dinner fast every night! I love that this is healthy too though, because that’s usually not the case when it’s fast. Thanks for a great weeknight recipe! Wow, that dish looks absolutely amazing! I really need to kick my food photography into gear, I’m inspired by your photography! Now that is a dinner I can totally sink my teeth into! It looks amazing! Looks delicious! I love both of those magazines. They have great ideas! Yummy! I love a quick dinner . . . and especially when it only gets one dish dirty. Looks great!